My dear friend Mary posted this recipe and I’ve used it before. Delicious apples for an accompaniment to pork dishes, as a dessert or snack, and delicious on ice cream. 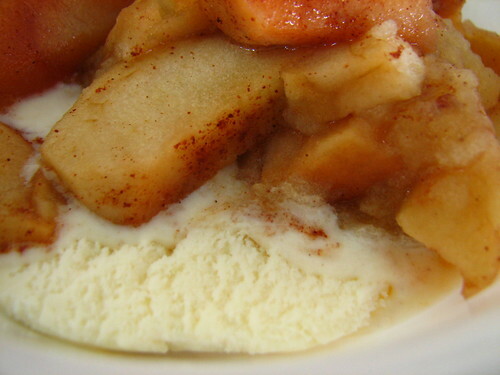 Like apple pie without the crust or added calories. 2-6 apples, depending on how many you want. I used 5 today; a combination of Golden Delicious, Granny Smith, and Jonathan. I like to peel the apples, but you don’t have to. Wash them well. Cut into wedges and remove the core. 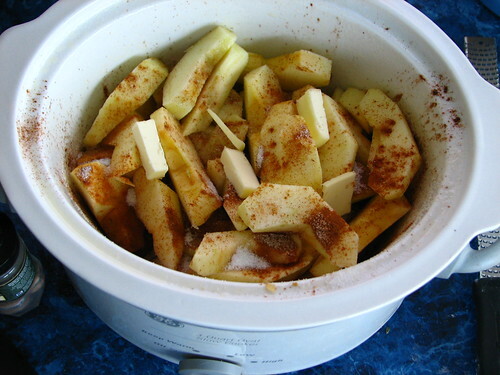 Place the apple slices in a greased crock pot. I have a small one that works perfectly for this. Put half the apples in, sprinkle with cinnamon and sugar, add the additional apples, and sprinkle on more cinnamon and sugar. The amount is up to you. I use about 1 teaspoon of cinnamon altogether and about 3 T. sugar. I add a small amount of freshly grated nutmeg over the apples, too. Just a few slides up and down the microplane grater. Top with a pat of butter. They were wonderful on vanilla ice cream, BTW. This entry was written by ~~Rhonda, posted on April 3, 2009 at 5:19 pm, filed under Recipes and tagged apples, cooking, recipe. Bookmark the permalink. Follow any comments here with the RSS feed for this post. Post a comment or leave a trackback: Trackback URL. I feel so honored to have a link from your blog 🙂 I will have to try the nutmeg in mine the next time I make them.